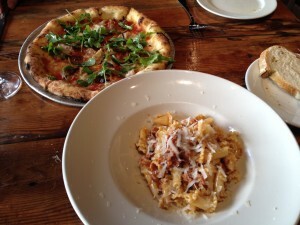 Our last meal in Napa was at Oenotri, an Italian restaurant with a wood fueled pizza oven. They offer a 3 course lunch for $20; we shared that as well as a sausage and caramelized onion pizza ($13.5). The pizza was delicious; I really enjoyed the crust and the toppings were flavorful. It occurs to me that we ate a lot of pizza on this trip. 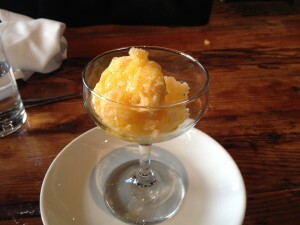 The lunch included a salad, a pasta with a pork ragu and a mandarin granita. The salad was refreshing and light; I enjoyed the lemon vinaigrette. The pork ragu was hearty and flavorful. The granite was the only flaw in the meal. The texture was all wrong – instead of fine crystals, the ice was hard and chunky.